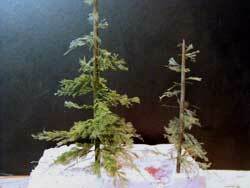 I needed some pine trees for a logging camp scene I was working on for my Utopia Northern HO model railroad. There are several common techniques like bottle brush trees, furnace filter trees and commercial kits by Woodland Scenics and others. In my case I had several kits sitting on the shelf: Kit 100 pine trees by Campbell Scale Models and two packages of "The Ultimate Pine Trees" by Color-Rite. I don't know if the latter are still available. Both kits use air fern for the branches. Air fern has a delicate, airy structure as the name implies. It is sometimes available through florists or garden centres. The process is to drill tiny holes in the trunk of the tree and insert the air fern branches cut to shape. Some kits, such as the ones I had from Color-Rite, use plastic trunks with cast-in detail. Others can have wooden trunks. The Color-Rite kit suggested carving a shallow groove in a piece of soft wood and drilling a 1/8" hole 3/16" from the end. The depression holds the tree trunk in place as it is rotated to drill holes. The kit came with a cut off #18 sewing needle. The method was to push the needle through the plastic tree, thread in a length of air fern, and then gently pull the branch back through the tree. I had varied success with this method, probably because the packages of air fern I had were very old. I had better success pre-drilling the holes and inserting the air fern by hand. This is also the procedure I used for wooden trunks. The 3/16" spacing for branches seemed about right for HO scale. The kit recommended starting with 4 branches 90° apart at the bottom of the tree keeping the holes as close as possible vertically. Then work your way up the tree making the branches shorter the higher up you go until about 3/8" to 1/2" inch from the tip. The jig really helps. I also inserted a straight pin into the bottom of the tree and cut off the knob at the top. This allowed the tree to be held in a styrofoam block for drying and for later planting on the layout. I had some old strips of balsa wood that I shaped and tapered with a sanding block to make additional trees. There's enough air fern in the kits to do so. The trunks can be distressed to look like bark by dragging a fine-tooth model saw along the wood or by using a MicroMark distresser tool or even a file cleaning brush. Balsa takes indentations quickly and is easy to shape. I painted the pine trees with inexpensive DecorArt burnt umber acrylic paint, and when dry, dry-brushed the trunks with Polly Scale E/L Gray. The next step was to drill holes up the trunk. I maintained the general spacing using the jig as a guide and followed Color-Rite's recommendation to rotate the pine trees approximately 120°, keeping the holes as close as possible. The branches get progressively shorter the higher up the tree with the last ones about 3/8" to 1/2" from the tip. I did this by eye. Nothing fancy. Ponderosa pine trees can have a wider spacing and the branches tend to have a slight upward angle. 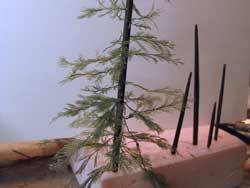 I put a small dab of Weldwood white glue on the end of the air fern branch and gently poked it through the hole. (The #18 needle pulls it back through the hole if you go this route). In either case, some of the branch ends can be left intact. It makes them look like dead branches. I also saved all the dead ends to make a few dead, or almost dead, pine trees. Some trees have very short branches at the tip. These can be held in place with Walthers Goo or anything similar that will keep them in position until the glue sets. Below is a completed tree. It's surrounded by balsa trunks of trees that are yet to be made. I cut some of the balsa to different lengths. Short leftovers can be used as dead fall in the forest. Branches can be re-trimmed with an X-Acto knife or scissors if you're not happy with the final shape. The Color-Rite instructions also mentioned that trees are subject to the wind and one side of trees may be fuller than the other. This is an interesting observation if you plan to plant your trees on a high bluff on your model railroad layout that would be subject to a strong wind. Reminds me of the Group of Seven paintings of northern Ontario. There are additional things that can be done to enhance the look. On the trees below, the one on the left has been sprayed with cheap hair spray as a fixitive and Woodland Scenics fine blended turf has been sprinkled onto the tree from above. This fills out the tree. The one on the right has had no special treatment. The tree on the left has been sprayed, On the right, not sprayed. It takes 20 to 30 years to grow a typical pine tree for harvesting. Ones in western North America can be much older and taller. Go from "pine-trees" to scenery overview. Go from "pine-trees" to mountain backdrop painting. Return from "pine-trees" to my Home Page.